i just saw one in Shat city... wtf? You get Mr. Pinchy http://www.wowhead.com/?item=27388 from fishing from highland mixed schools. Mr. Pinchy then grants you 3 wishes... one of which can be the Furious Mr. Pinchy! Any hunter tried to tame him? As confirmed by a GM, this mob is not actually lootable. 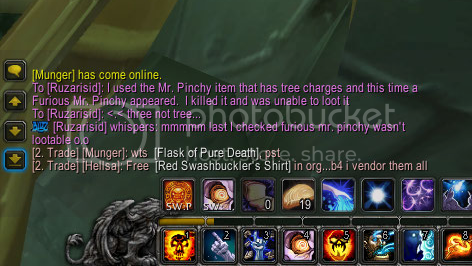 Hunters, careful with your pet on this one, if you use the Mr. Pinchy wish, and you get Furious Mr. Pinchy, if he damages you your pet will aggro and insta kill him.